The dotted fabric is from Amy Butler and will be used as pocket and waist lining. 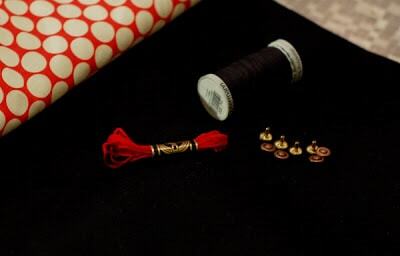 I also plan to do some hand stitching, thus the red embroidery floss. 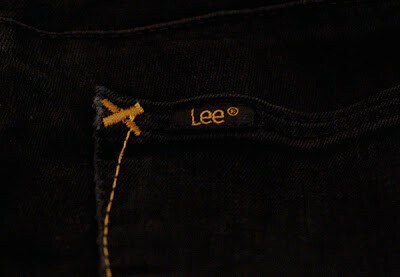 The jeans fabric is a heavy weight stretch denim. I’ve finally gotten started on my skinny black jeans. I had originally planned to use the Patrones pattern, but when I measured the pattern it turned out that the pants were not that skinny at all, for instance they had almost 3 inches of ease around the thighs! I don’t know what’s up with that, Patrones has always been true to size before, and on the model they look almost like leggings. While I love loose fitting regular jeans, baggy skinny jeans is not a look I’m keen to wear. So I ended up drafting my own pattern, using my regular jeans block and scaling it down to make the fit snug. I’ve sewn up two muslins now and am pleased with what I see in the mirror. To be honest I can hardly sit down in them, but right now I don’t care, I just want my skinny black jeans! And jeans grow with wear, don’t they? Inspiration. 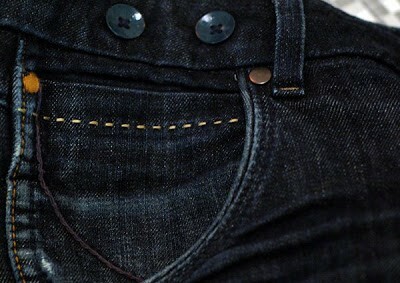 Lee and Wrangler often has wonderful details on their jeans, and I want to incorporate some of those ideas into my own jeans.